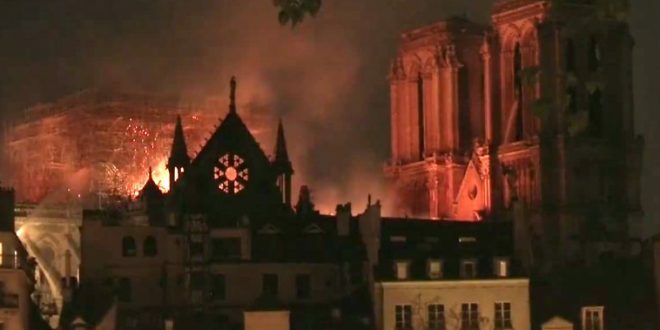 French Officials Walk Back Claim Of Total Loss Of Notre Dame, Interior Relatively Unscathed, Bell Towers Saved - Joe.My.God. Fire officials said late Monday that Notre Dame Cathedral in Paris was saved from “total destruction” after a massive fire broke out, engulfing much of the building and destroying its iconic spire and stained-glass windows. The blaze spread to the cathedral’s two rectangular towers Monday evening but was later contained. The news that the building has been partially saved comes after officials originally believed the entire building would burn to the ground. “Everything is burning. Nothing will remain from the frame,” cathedral spokesman André Finot had predicted earlier in the day.